A reaction engine that contains within itself, or carries along with itself, all the substances necessary for its operation or for the consumption or combustion of its fuel, not requiring intake of any outside substance and hence capable of operation in outer space. Also known as rocket motor. a jet engine that uses only materials and energy sources stored in the moving vehicle (air, land, and underwater vehicles). Thus, in contrast to air-breathing jet engines, rocket engines do not require a surrounding medium, such as air or water, for their operation. Depending on the type of energy that the engine transforms into the kinetic energy of a reactive jet, rocket engines are classified as chemical (thermo-chemical), nuclear, and electric rocket engines. Chemical rocket engines, that is, rocket engines operating on chemical propellants, are the most common. Nuclear and electric rocket engines are likely to become very common in the future, principally in spacecraft. the magnitude of jet thrust developed, and the design and function of the engine. In practice, however, the principal designs and operating processes of different types of chemical rocket engines are similar. All rockets have a main assembly consisting of a combustion chamber and nozzle (Figure 1,a). The fuel is oxidized and the reaction products—the heated gases—are released inside the combustion chamber. The gases are expelled in the nozzle as a result of expansion and exit at high speed, forming a reactive jet, that is, creating the jet thrust of the engine. With few exceptions, all chemical rocket engines operate in a continuous mode, and the pressure of the gases in the combustion chamber remains approximately constant while the engine is in operation. Some small chemical rocket engines operate in a pulse mode. Depending on the state of aggregation of the fuel, chemical rocket engines are classified as liquid-propellant, solid-propellant, or hybrid rocket engines, or as engines operating on jellied (thixotropic), pseudoliquefied, or gaseous fuel. Solid-propellant rocket engines are the forerunners of all rocket engines and are used for launching signal flares, fireworks, and military rockets; they are also used in space exploration. Their advantages are operational reliability and simplicity and constant readiness for launching over prolonged storage. Disadvantages include lower efficiency relative to the best liquid-propellant engines, difficulty in controlling the magnitude and direction of the reactive thrust, and, as a rule, the limitation of use to a single firing. Of all chemical rocket engines, solid-propellant engines develop the maximum thrust, and their specific impulse may reach 2.5–3 kilonewtons-sec/kg. Liquid-propellant rocket engines are the most developed of current designs. Such engines, particularly powerful models, are equipped with a number of complex automatic systems for launching and shutdown, thrust control, and the control of the propellant consumption and thrust vector. The efficiency of liquid-propellant rocket engines largely depends on the selection of the propellant components (primarily, of the oxidizer). The maximum thrust of individual liquid-propellant rocket engines approaches 10 meganewtons, and the specific impulse may reach 4.5 kilonewtons-sec/kg. Liquid and solid propellant components are used together in hybrid rocket engines. Hybrid engines usually have a solid fuel stored in the combustion chamber, and a liquid oxidizer is fed from a tank; this combination results in high energy efficiency. Some designs feature a solid oxidizer stored in the combustion chamber and a liquid fuel stored in a tank. A feature of hybrid rocket engines is the heterogeneous combustion of the propellant. The advantages and disadvantages of liquid-propellant and solid-propellant rocket engines are combined in hybrid rocket engines. Hybrid engines are not widely used. Rocket engines operating on jellied, pseudoliquefied, and gaseous propellants are still in the research stage (1975). In nuclear rocket engines, which are in the research stage, it is possible to obtain a specific impulse significantly greater than that developed in chemical rocket engines. 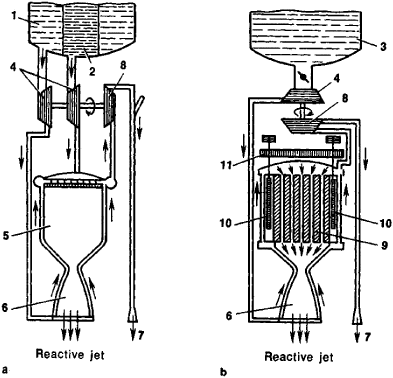 The heat released in the nuclear reactors is used to heat the working fluid; that is, in nuclear rocket engines, in contradistinction to chemical engines, the energy source and the working fluid are separate (see Figure 1, b). An increase in the specific impulse by a factor of tens and hundreds can be achieved using electric rocket engines, in which electric energy is converted into the kinetic energy of a reactive jet. In theory, photon (quantum) rocket engines, in which the reactive jet is formed by quanta of radiation, have the most potential. A possible area for the use of photon rocket engines is interstellar flight, but no workable way to construct such rocket engines has yet been found (1975). Depending on their use in rocket and space technology, rocket engines may be classified as propulsion engines (the principal engines in a rocket used, for example, to accelerate the rocket to escape velocities), attitude and control engines, retrofire engines, vernier engines, steering engines, and stabilizer engines. Rocket engines are used in aviation as main and auxiliary (starter and assist) engines. A pump, fuel tank and petrol engine will be used to get the HTP to the rocket engine. Establishing this new Center of Excellence is vital to reducing our reliance on foreign-made rocket engines. After successfully testing the duct, the Marshall engineers moved on from the J-2X rocket engine to developing a smaller engine more compatible with the build box of available 3D printers. Additive manufacturing layers metallic powders to form engine parts, but much is still unknown about the ability to produce rocket engine parts reliable enough for use on launch vehicles carrying humans. We would provide this as a new product, at low cost, to rocket engine vehicle providers," Haynes said. Three of the new rocket engines made their space launch debut in Friday's Delta 4-Heavy flight by rocket provider United Launch Alliance. Several rocket engine test cells at the facility allow testing the rocket engines and rocket engine components while holding them stationary allowing instruments to monitor all the parameters of engine performance. An ejector rocket engine is designed to boost the thrust of a rocket by mixing air from the intake with fuel. Now celebrating its 50th anniversary in October, Hancock County's Stennis Space Center has become America's largest rocket engine test complex. The Rocket Engine Test Facility (RETF) at what is now the NASA Glenn Research Center was built in 1957. MOJAVE -- XCOR Aerospace announced Tuesday the successful first firings of a 7,500-pound thrust rocket engine, under a program to aid the development of NASA's next manned spacecraft. I'm surprised that NASA envisions an absurdly massive, nuclear-powered "gravitational tug" to avoid "the biggest problem" of a contact-tug's need to "fir[e] its rocket engine only at specific times" to compensate for an asteroid's rotation ("Protecting Earth: Gravitational tractor could lure asteroids off course," SN: 11/12/05, p.